Electro-chemical machining (ECM) is a fascinating production method, because the technology involves virtually no workpiece contact: A direct current, or pulse, is used to polarize the workpiece positively, to create an anode, and the tool negatively, for the cathode. An electrolyte solution flows between the two, and metal ions detach from the workpiece. The components are not exposed to any mechanical or thermal stress during the process. This approach offers significant benefits for automotive mass production. This has been proven for many years by the specialists at EMAG ECM, the technology company for electro-chemical machining (ECM) within the EMAG Group, based in Gaildorf, Germany. For example, a process can easily be implemented to machine larger quantities of parts simultaneously using ECM – fast, precisely, and without any tool wear. 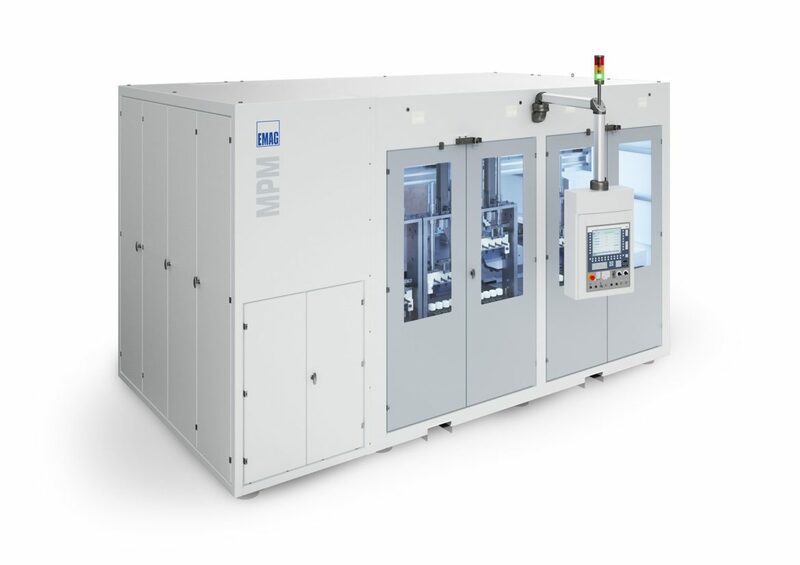 The newly developed ECM machine with its multi-process module (MPM) represents a significant development step. The goal was to integrate as many part-related ECM sub-processes as possible in a single machine – from pre-cleaning on to different ECM stations for 4, 8 or 12 parts, and to final rinsing and protective coating. One option is to perform ECM subprocesses on the part (e.g. OP 10, OP 20, OP 30 and OP 40), whereas another option is to run the same process in parallel (e.g. 4 x OP 10) in order to increase the output even more. The process modules used for this purpose can be flexibly adapted to the task, both in functionality and number. All of these processes are interlinked by the integrated automation. In the end, perfect parts are being developed on a machine that takes up only a small space. The new ECM-machine with multi-process module (MPM) is already successfully in operation with an automotive supplier. High-quality injectors for car engines are produced by the second and the range of conceivable parts is huge. It includes turbine wheels and turbine housings, cam elements, pistons, and various transmission elements such as synchronizer hubs and drive shafts.